TOKYO—More than a decade after a disastrous foray into investments abroad, Japan’s biggest telecommunications group is trying to grow overseas again. As part of a renewed overseas push, Nippon Telegraph & Telephone Corp. is spending billions of dollars on acquisitions, mostly in the U.S. It is establishing a beachhead in Silicon Valley, opening a research center and showroom, poaching engineers and joining with local companies to make the information-technology systems it designs more user-friendly. 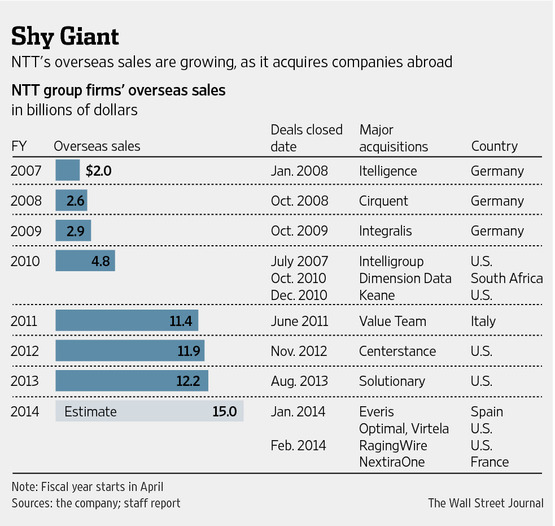 Last year alone, companies in the NTT group spent $2.4 billion on deals abroad, almost triple what was spent the previous year, according to data from Dealogic. The push abroad is crucial to keeping profits up at NTT, a behemoth with annual revenue of $105 billion, a cash hoard of $11 billion and operations that span fixed-line and mobile telecommunications as well as IT services. Almost 90% of that revenue comes from Japan, where the market is stagnating. NTT hopes to lower that dependency, and become a significant competitor in the global IT-services business, alongside companies such as IBM Corp. IBM, Tata Consultancy Services Ltd. , Accenture, and Hewlett-Packard Co. But to succeed, NTT will have to buck a dismal track record of investing overseas, where it spent a combined $15 billion on stakes in AT&T Wireless Group, KPN Mobile NV in the Netherlands and Hutchison 3G U.K. Holdings Ltd. in the late 1990s and 2000, hoping to spread its mobile-Internet technology. The investments soured, forcing NTT to take a loss of ¥812 billion (US$7.8 billion) in 2002. All together, the group booked losses almost equivalent to the entire amount invested. “We paid a high tuition for lessons on M&A,” NTT board member Tsunehisa Okuno said in an interview. Mr. Okuno said the main problem with some of NTT’s past deals was that the company didn’t fully understand what it was buying. Now, NTT spends an average of two years to consider acquisitions, he said, to make sure that target companies share the same vision. Still one-third owned by the government, and a majority shareholder of Japan’s biggest wireless carrier and its biggest IT-services firm, NTT has a sprawling portfolio of 946 subsidiaries in areas as diverse as real estate, finance, logistics, electronics and power systems. NTT’s goal is to push the overseas portion of its revenue up—it is expecting non-Japan sales to increase 23% to $15 billion this fiscal year—and to raise its profit margin to near double digits from 5.4%. Most of that growth will be in the sales of servers and routers as well as IT services, such as helping companies store and access their information in data centers. In the year ending in March 2017, the company expects more than half of its entire enterprise business to come from outside Japan. NTT is already a sizable IT competitor. It has more than 250 data centers around the world, putting it among the top providers of data storage in terms of server-room floor space, according to market-research firm TeleGeography. It aims to buy more companies overseas to gain expertise and a solid customer base quickly—particularly in the U.S., which executives say is at the forefront of IT-system innovation. That know-how is essential to grab corporate clients in other markets, including Japan and emerging markets, they say. This year, NTT group companies have already bought U.S. providers of data processing, network-and-security services and IT-systems services, for undisclosed amounts. NTT subsidiary NTT Communications spent $350 million for about 80% of data-center company RagingWire Data Centers. NTT’s acquisitions have helped open doors in the U.S., said Mr. Okuno; the company has won contracts to design and maintain IT systems for customers such as Yum Brands Inc., which owns Kentucky Fried Chicken and Pizza Hut, and the Texas Department of Transportation. NTT’s breadth of operations in IT and telecommunications is likely to help it win more contracts from companies looking for one-stop IT-systems management, executives say. Not even IBM owns and maintains Internet backbone networks, they say. That one-stop approach—from networks to security programs to advice on hardware-software combinations—could also make its services less expensive than rivals, long-term, executives say. NTT also hopes its new Palo Alto, Calif., research-and-development center, NTT Innovation Institute Inc., will develop new products to make companies’ IT systems faster and more secure, and raise its profile versus better-known brands Accenture or H-P.
“There’s a lot of momentum,” Mr. Okuno said, adding that more U.S. customers now have heard of NTT’s enterprise services, compared with just a couple of years earlier. Some analysts say the company is still hamstrung by a cautious, conservative culture and poor decision-making. So onerous is the scrutiny from headquarters that NTT’s subsidiaries sometimes cap deal sizes in the hope that smaller deals will escape the holding company’s bureaucratic wrangling and oversight, people familiar with NTT’s deal-making said. Mr. Okuno, who is involved in vetting overseas deals, said scrutiny is just as stringent for small deals as it is for big ones. He said the company can’t afford to be cautious and conservative in the U.S., where it is the underdog. In April, NTT cut losses on another large overseas investment—a 26.5% stake in India’s Tata Teleservices Ltd. bought for about $2.7 billion. Analysts and investors say NTT remains bloated with overlapping business divisions that slow down decision-making on deals. “NTT is a very big ship—it takes a long time for it to change course,” said a fund manager who owns shares in NTT.